While there are lots of steps to completing your custom quilt. The ones that you are probably worried about are simple. Once you have shipped your shirts (or dropped them off at the shop), what goes on? Sounds simple. But, you have several options. If you are in the area, you are invited to come to the studio, (just make an appointment and come on by). If you are not in the area, or just don't have time, no worries, just ship them via the Post Office, UPS or Fed Ex Ground. ** Be sure to keep your tracking number! We double check that you have included an order form, a deposit* and that the number of shirts indicated on the form matches what you sent. 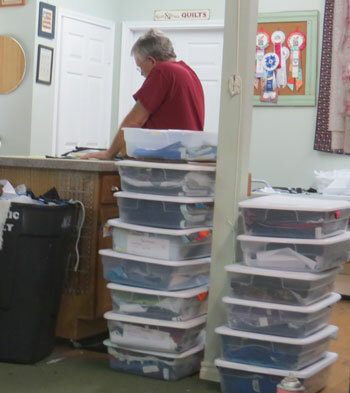 We put your shirts in its own project box, where the contents are isolated during the entire process of completing your quilt. We enter the order into our proprietary software order entry system, which produces an estimate, cutting layout and documentation to keep track of your quilt as it moves from one step to the next in the process of creating your quilt. We use the best practices available and continually review our processes for improvements. (Hubby is an engineer, and all about 'procedures'). Before the shirts are 'prepped', they reside on the incoming shelf with the selected bolts of fabrics. Next, we prep the shirts and cut all the fabrics to complete your quilt. 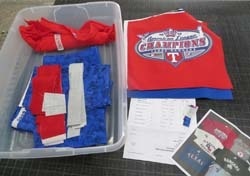 Everything is put back into the project box until it is ready to be sewn. All of the fabric for the borders, sashings, cornerstones and backing are cut at the same time we prep your t-shirts. 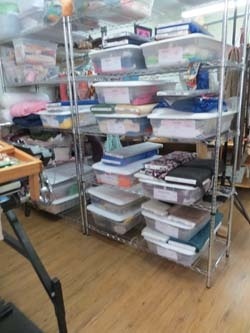 All items stay safe and secure in their own project tub as they go through the various steps of production. We (i.e. hubby) prep shirts twice a week. He rough cuts the shirts, adds the 100% cotton fusible cotton backing (NOT the stiff stuff), and then cuts to size. Your quilt is professionally machine quilted on a longarm quilting machine. 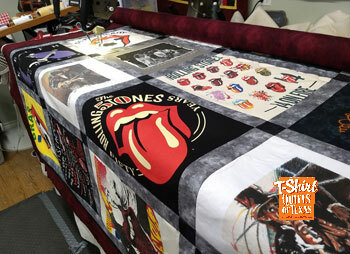 We use the latest computerized technology to give your quilt a consistent all-over design that does not detract from the tshirts. Your tees are the star of these quilts. There are several patterns that we use on a regular basis, but if you have a special request - just let us know. Binding is the final step in completing your one-of-a-kind quilt. Binding encloses all the raw edges of the quilt and gives the quilt a professional finish. Usually, the binding will be the same fabric as the outer border. Read more about the Difference Between Binding and Borders. You always have the option of picking up your quilt, or we can ship it back to you. Mostly, we use USPS Priority Mail. You will be sent a USPS tracking number via email when we create the shipping label. Return shipping prices are based on USPS pricing. * Please note, we can no longer start work on your project without a deposit. ** When shipping a package, please do not ask for signature confirmation, as you will most likely delay delivery of your package by a day or so. We have a secure area that our Postal, UPS and Fed-Ex carriers are familiar with, and will deliver in a covered area protected from the elements.